It is time to move past institutional integration and develop practical European security capabilities. Europe is facing multiple security challenges. Russia aims to undermine the European security order and has shown its willingness to violate other countries’ sovereignty and increase its nuclear power. The Middle East and North Africa are on fire, homegrown terrorism threatens the streets of Europe, and cyber and information warfare are on the rise. Europe is currently ill-equipped to manage this spectrum of threats, and it can no longer rely wholeheartedly on US security guarantees. Citizens from Warsaw to Paris, Lisbon to Berlin rightly expect Europe to protect them. Guaranteeing the security of its citizens and preserving peace on the continent is the best way for the EU to prove its legitimacy to a new generation of Europeans. French President Emmanuel Macron’s injection of energy into European co-operation, and changing German attitudes to security initiatives have opened a window of opportunity to make progress in this area. Importantly, there is also an increasing acceptance across Europe of the need to allow smaller groups of countries to pursue ‘flexible’ integration, replacing the restrictive requirement of unanimous support for new integration initiatives. The EU has taken a step into this direction with PESCO, the Permanent Structured Cooperation, under whose umbrella concrete security projects are being developed. But this cannot be the end of the line. PESCO focuses on small-scale technical projects instead of political initiatives that could capture the public imagination. With the new German government to take up work shortly, now is the moment to initiate bigger changes. This proposal seeks to set out some concrete steps towards the goal of a ‘Europe that protects’. Too often, European approaches to common security and defence policy have focussed on institutional integration, rather than on producing capabilities. But European defence integration will only be legitimate if it actually increases security. To do so, it must create new operational capabilities. Europe is and will remain a force for peace, but it must have the capability to protect European interests with European troops, including, when necessary, through interventions. New capabilities require investment. There is no way around this simple fact. This includes Germany. Europe therefore needs to remove the barriers to investment in military capabilities. We support the idea of the next Multiannual Financial Framework (MFF) including a defence component. In the long term, the EU can increase its capabilities without spending much more by pooling and sharing its equipment. The EU has a six times higher diversity of weapons systems compared to the US; for example, for every US destroyer/frigate model, the EU has seven. However, there are at least two reasons why buying equipment together cannot be sufficient. First, the security threats facing Europe are here today. It is certainly advisable for Europe to research and develop weapons systems jointly, but such developments and acquisitions take decades. Second, fully ‘pooled and shared’ European military capabilities only make sense if they are under a unified European command. 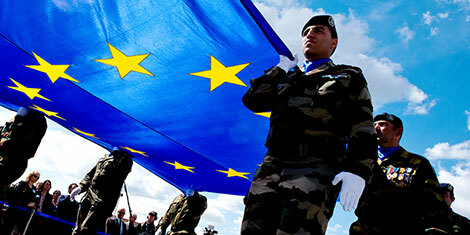 A fully integrated European military force – the infamous ‘European Army’ – is out of the question for the time being. As long as member states’ governments and parliaments retain the power to decide whether their military participates in operations (a veto which we vigorously support), fully ‘pooled and shared’ resources risk creating paralyses rather than new capabilities. That being said, there is one area in which common investment and acquisition is particularly promising and should begin immediately. That is, with regard to newer technologies, including cyber, drones, and artificial intelligence (AI). We welcome the proposed PESCO projects in this area and recommend the development and acquisition of common equipment, such as a European drone, and anti-drone technology. Research in the area of AI and autonomy should as much as possible be done on the European level and be funded in part by the European Defence Fund. Europe also needs a common position on the legality of lethal autonomous weapons. The proposal of establishing a European agency for disruptive innovation, a European DARPA, is a step in the right direction. Further exchange with regard to cyber threats – such as the Network Information Security Directive – but also with regard to cyber capabilities is needed. Given that these are new technologies, there are fewer established national idiosyncrasies to overcome, creating greater opportunity for common European action. The crux of our proposal is the development of a flexible European security force. Emmanuel Macron’s proposal for a European Intervention Initiative is a promising opening, but it is likely to fail if other member states perceive it as a vehicle for French interventionist foreign policy goals. Threat perceptions around Europe vary dramatically: citizens in Madrid have very different concerns to those in Tallinn. For this reason, Macron’s initiative should be broadened out into a wider European Security Initiative, explicitly designed to deal with other European nations’ security concerns, such as territorial defence and border security. Part of this should include the establishment of a combat-ready flexible European military force able to participate in EU and UN missions, made up of soldiers from different European member states. This would go beyond the existing EU battlegroups in scale and design. Most importantly, these troops would share equipment, permanently train together, and participate in an annual ‘train as you fight’ exercise. Eventually, this should become a substantial force – in the region of 100,000 soldiers – able to make a real impact. It should also include an amphibious capability, so as to be able to operate around the coasts of Europe. Crucially, however, states that want to join this force should have to meet ambitious entry requirements. These should include minimum troop contribution and minimum defence spending thresholds. These have to move beyond the low entry requirements of PESCO to ensure that all members are fully invested in the project. Rather than a European Army that would replace national military forces, this should be understood as an additional Army of Europeans. In practice it would be based on combining a small proportion of existing troops and equipment with new forces and resources. But the key point is that each country would retain their existing, fully functional independent military force. Polls have shown that the European public would support such an initiative. A recent survey showed that 75% of respondents favour significant cooperation between national armies, with greatest support for a model in which national armies can often operate together but still be employed independently. This force could be combined with a stabilisation and civilian component – including police, border guards and other facilities – that might be hosted in PRISM (Prevention of conflicts, Rule of law/SSR, Integrated approach, Stabilisation and Mediation) or by a member state. Of course, the deployment of military force has to be taken by the member states whose soldiers are put into harm’s way, rather than by EU institutions. The deployment of troops would require a unanimous vote of the participating countries, but the ambitious entry requirements should reduce the problem of paralysis described above. In no way would this force undermine NATO capabilities. On the contrary, NATO has repeatedly said that it would welcome increased European capabilities and combat readiness. In the long run, this force will build confidence in EU operational capabilities, add to Europe’s security, and demonstrate the advantages of shared equipment and integrated systems. In this context, we welcome the PESCO projects, such as the plans to establish a European medical command, a Deployable Military Disaster Relief Capability Package, and several unmanned maritime systems. “More European, More Connected and More Capable”, Munich Security Conference Report 2018, p.20. Mark Leonard is co-founder and Director of European council on Foreign Relations (ECFR). Dr Norbert Röttgen is the chairman of Foreign Affairs Committee of the Bundestag, Germany.